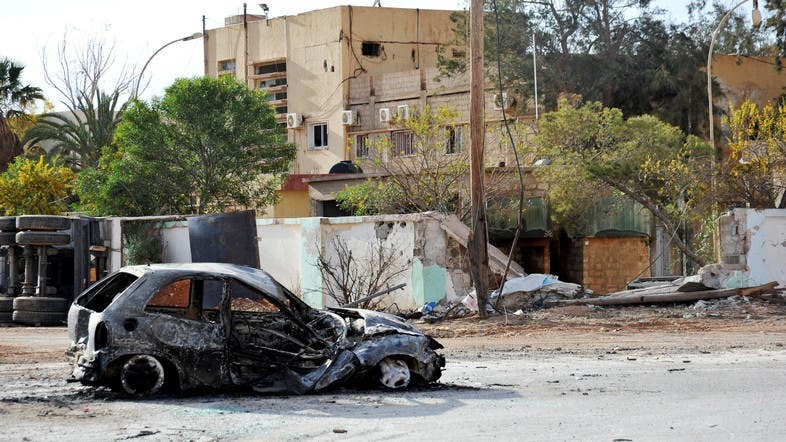 At least seven people were killed and eight wounded when a suicide bomber targeted forces loyal to Libya’s eastern government in Benghazi on Sunday, medical and security officials said. ISIS said it carried out the bombing, in the besieged district of Ganfouda. The area is one of the last pockets of resistance holding out against the Libyan National Army (LNA), a self-styled force loyal to eastern commander Khalifa Haftar. Haftar has been waging a military campaign in Benghazi for more than two years against Islamists and other opponents. The fighting is part of a broader, low-intensity conflict in Libya, which splintered into multiple political and armed factions after the uprising that toppled Muammar Gaddafi in 2011. This year the LNA has made major gains in Benghazi, though fighting and attacks have continued in parts of the city. All those killed in Sunday’s bombing were from the LNA, a medical source from Benghazi’s main hospital said. The attack came after the latest advance on Saturday by the LNA, which said following heavy clashes that it had taken control of buildings along the seafront west of Ganfouda, encircling its opponents. At least three LNA troops were killed in Saturday’s fighting, security and medical officials said. An LNA spokesman, Ahmed al-Masmari, said 13 fighters from “terrorist groups” had also been killed. Recently there have been efforts to evacuate civilians trapped by the fighting in Ganfouda but only small numbers of women and children and foreign workers have left the area. Masmari said on Sunday that about 120 families remained inside Ganfouda. Those fighting the LNA in Benghazi include the Benghazi Revolutionaries Shura Council (BRSC), a coalition of Islamists and self-proclaimed revolutionaries, as well as militants loyal to ISIS.